On Sunday at 10:00 a.m., between the Traditional worship service and the Contemporary worship service, we gather together in small comfortable groups throughout the facility, in order to study and discuss God’s word in a relaxed atmosphere of Christian fellowship and mutual support. All persons are welcome, no prior knowledge or experience is required, and there is no such thing as a dumb question! Sunday School is a great way to help us connect the Bible to our busy modern lives. Our groups are informal in nature and tend to be organized by similar ages or interests, including Sunday School just for kids. 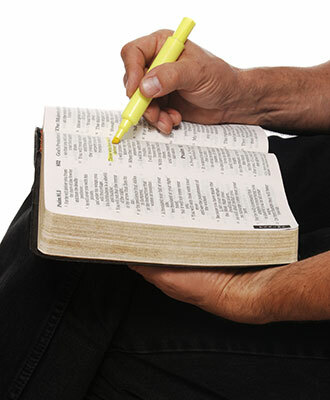 On a typical day, a group will focus on a particular Bible verse, chapter or lesson, and examine it in detail. This might be a stand-alone subject, or one in a series of studies. The material may be presented in print or video. The subject matter can be virtually any facet of God’s word and how it relates to our daily lives. Not sure where to go? Just ask, and we will be happy to explain the options and help guide you to their study areas. It is also very acceptable to try a number of different Sunday School options to help you decide on the best fit for you. Gathering together informally in small groups to study and discuss God’s word is how the Church got it’s start thousands of years ago, and it is still the heartbeat of the Church today. Come join us! We offer a variety of Sunday School classes from 10:00am to 11:00am. Everyone is welcome, no prior knowledge or experience is required, and there is no such thing as a dumb question! The children will learn about a particular person or topic by doing crafts, singing songs, reciting scripture, and moving their bodies (kinesthetic teaching). Pre-Kindergarden (potty trained; 3-5 year olds) is located in Room 123. 1st – 3rd Grade is located in Room 121. 4th – 6th Grade is located downstairs in Room 7. From 10:00am to 11:00am, we strive to provide clarity to God’s Word and His will in the students’ lives, and we have a lot of fun doing it! The purpose of our Youth Sunday School classes are for students to grow in their understanding and ability to respond to difficult and relevant issues or topics as Christ’s disciples. Various topics and questions are addressed, discussed, and researched so students are prepared to defend their faith in Jesus Christ. It’s a great time to come, have some fun, and connect as part of a family. Junior High is located downstairs in Room 2. High School is located downstairs in Room 3. We call ourselves the “Young Adult” class, but we have no age restrictions. If you believe you are a “young adult”, or perhaps are “young” to the study of the Bible, then you are welcome! Other than the all-church studies that we occasionally do, our curriculum is:  The Bible. Our approach is simple and casual. We have open discussions about God’s Word and questions are encouraged. Our class studies various biblical studies relating to specific topics and often current events. Sometimes our studies use DVDs featuring contemporary Bible teachers. The class discussion is focused on how the information we are studying can be applied to everyday living as a Christian and disciple of Christ. Adults of all ages are welcome to join our study and discussion. Our class enjoys reading scripture and discussing the application to daily life. We often use the United Methodist Adult Sunday School Curriculum, studies using DVDs featuring contemporary Bible teachers, or studying specific books of the Bible. Adults of all ages are welcome to join our class. Our class watches various types of videos, such as current religious movies or videos about Bible personalities, and then has discussion based on the topics presented. We generally do not use printed lessons. Most of our class are Senior Adults, but we welcome adults of any age to join us.